An old postcard showing the Bonneville Hotel in earlier days. The Idaho Falls Redevelopment Agency, which has handled urban renewal in Idaho Falls for more than 25 years, has released a Request for Proposals for two major downtown revitalization projects. The first project is for the property at Broadway and Memorial Drive, where Savings Center was. The agency is offering the site to potential developers as a location for a multi-story property with commercial and residential uses. The second project is the renovation of the Bonneville Hotel, at the corner of Constitution Way and Park Avenue. The RFP encourages developers to consider using the building for housing on the upper floors and office or retail uses on the first floor. 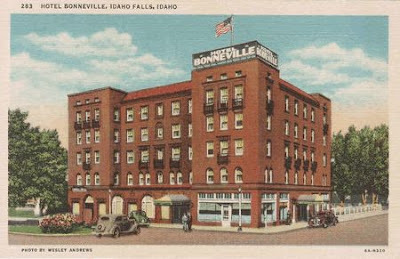 The Bonneville Hotel was built in 1927 by a consortium of investors from the community as a hotel and convention center. It is listed on the National Register of Historic Places, and developers could likely be assisted by historic preservation tax credits, low income housing tax credits, and Community Development Block Grants available from other sources. Proposals are due to the Agency by May 2. Full packets can be obtained by contacting the agency’s executive director, Brad Cramer, also the city of Idaho Falls' community development services director, at (208) 612-8276. “We hope that creative developers will come forward with innovative ideas and exciting plans for buildings that will encourage further development of downtown Idaho Falls,” said Lee Radford, chairman of the agency. The Savings Center property is owned by Vern Kelsch, who ran the store for years. The Bonneville is owned by Kent Lott. Radford said the agency is very grateful that the owners have shown a desire to see the properties developed in the best interests of the community. The Redevelopment Agency has been responsible for the transformation of big sections of Idaho Falls, especially the Idaho Falls Greenbelt. Snake River Landing and Taylor Crossing on the River would not have been possible without tax increment financing administered by the agency. It began work in the Snake River Urban Renewal District in 1988, reconstructing Lindsay Boulevard, Utah Avenue, Wardell Avenue, a portion of Milligan Road, and Memorial Drive with the tax proceeds from new development. As part of this street reconstruction, the agency administered funds that allowed the city to install water and sewer lines and storm drainage. It also financed the relocation of transmission lines to spur development east of Interstate 15. In all, the assessed valuation of the district has increased by over $140 million. The Snake River district will end on Dec. 31, 2018, although the agency may continue to receive the tax increment money into 2019.